Pseudocraters are distinctive landforms generated when a lava flow moves across ground containing either water or ice; the heat from the lava causes the water or ice to flash to steam, generating localized explosions through the lava. In the Eifel area of Germany, such explosion craters are often (but not always) later filled with water, and they are called maars. Important aspects of their formation, which distinguishes them from cinder cones and other monogenetic volcanic vents, is the lack of a source for erupting lava beneath the lava flow or resulting crater; the explosive action is strictly the result of the sudden generation of steam resulting from the heat of the overlying lava flow. Pseudocraters are typically much broader and shallower than cinder cones, and they may excavate through the entire thickness of the overlying lava flow, ejecting some materials from the rock beneath the flow. A classic locality for pseudocraters is the Lake Myvatn area of northern Iceland, where a 2000-year-old lava flow moved across wet or icy ground, generating numerous rootless explosion craters that were subsequently surrounded by the shallow waters of Lake Myvatn (Images 1 and 2). Image 2. 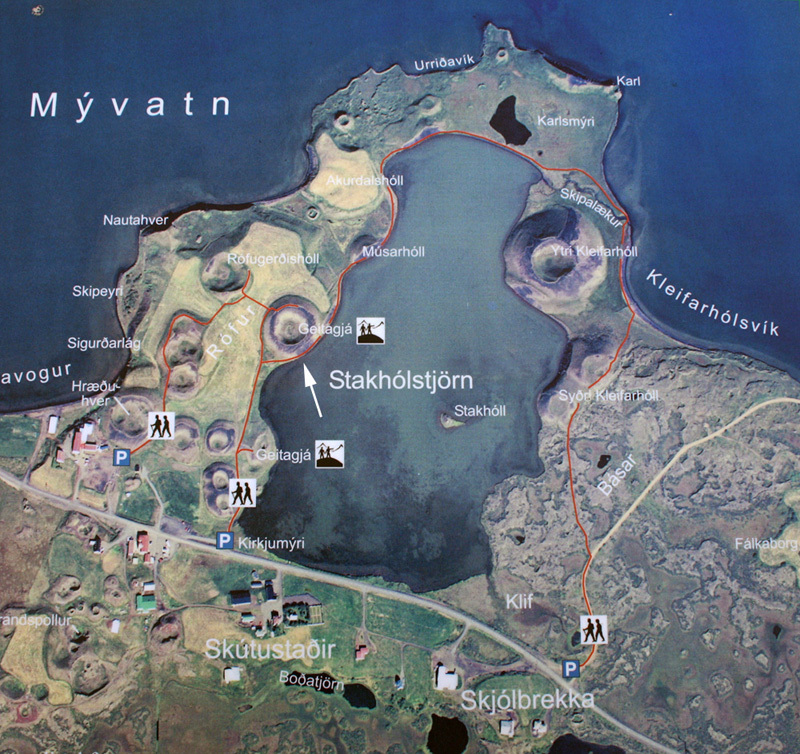 Sign at Lake Myvatn, showing walking trails among the pseudocraters. 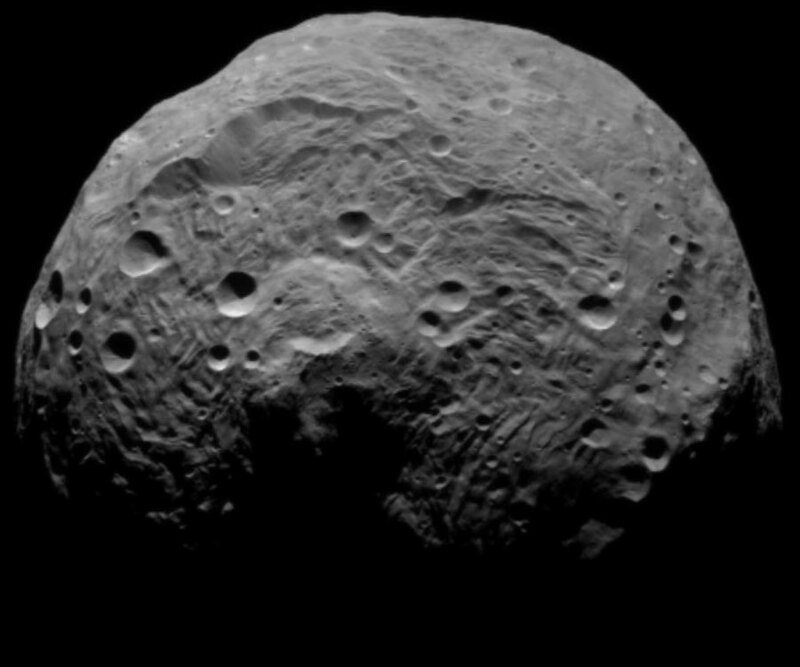 Arrow indicates the pseudocrater shown in Image 1. (JRZ, 8/25/10). 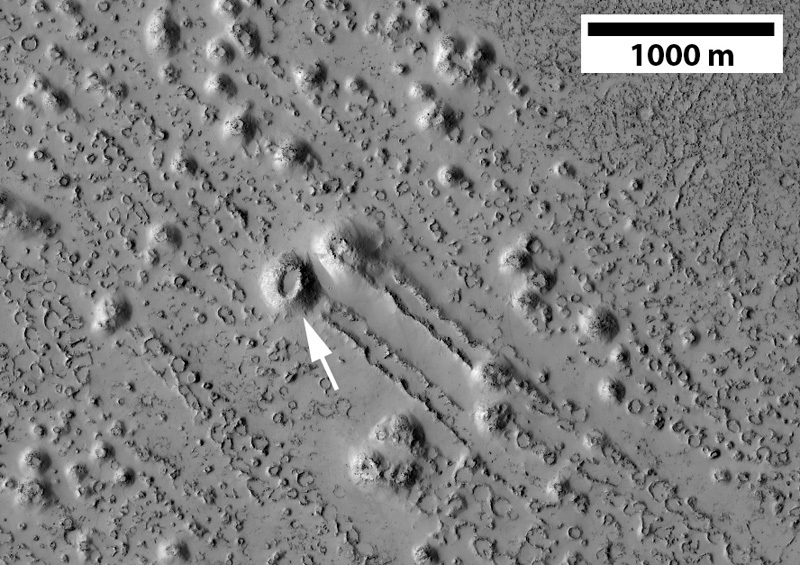 Pseudocraters have been proposed as the explanation for some broad but shallow craters in the northern lowlands of Mars since the Viking orbiter missions in the 1970s (e.g., Allen, 1979; Frey et al., 1979), but the Viking images were of insufficient resolution to provide definitive evidence that the pseudocrater mechanism was the best explanation. The remarkable resolution available from the High Resolution Imaging Science Experiment (HiRISE, McEwen et al., 2007) has revealed evidence that greatly strengthens the pseudocrater interpretation of many broad, shallow craters in the northern lowlands (Keszthelyi et al., 2010), particularly where lines of adjacent craters provide evidence of the direction of movement of the lava flow above the volatile sources that generated the steam explosions (Image 3, also shown in Fig. 6 of Keszthelyi et al., 2010). 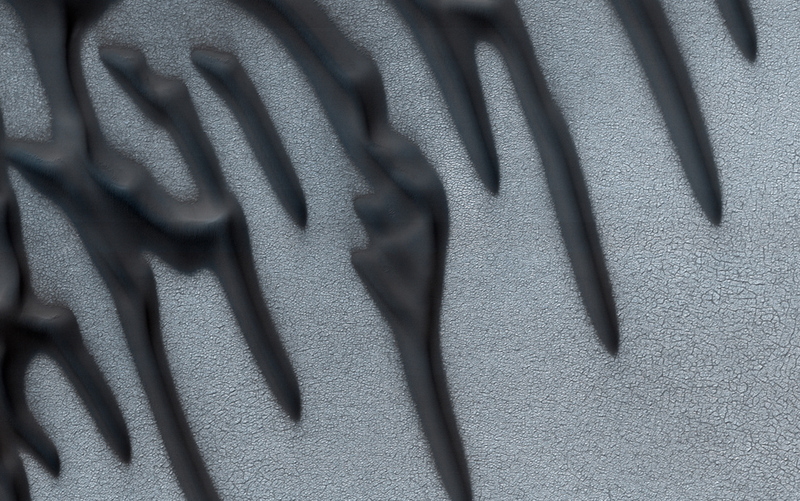 HiRISE images now show the aligned pseudocraters in exquisite detail (Images 4 and 5). Image 3. Portion of HiRISE image PSP006748_2060 , showing aligned shallow craters interpreted to indicate the direction of movement of a lava flow over volatile sources that generated the broad explosion craters. Same area as shown in Figure 6 of Keszthelyi et al., 2010. Entire HiRISE image centered on 26.0º N latitude, 173.7º E longitude. NASA/JPL/U of A. Image 4. Portion of HiRISE image ESP_018747_2065 , showing rows of aligned psuedocraters generally similar to those shown in Figure 3. Entire HiRISE image centered on 26.3º N latitude, 173.6º E longitude. Arrow indicates crater shown in greater detail in Figure 5. NASA/JPL/U of A. Image 5. Portion of HiRISE image ESP_018747_2065 , showing more detail on one psuedocrater from Image 4. Entire HiRISE image centered on 26.3º N latitude, 173.6º E longitude. NASA/JPL/U of A.
Allen, C.C., 1979. 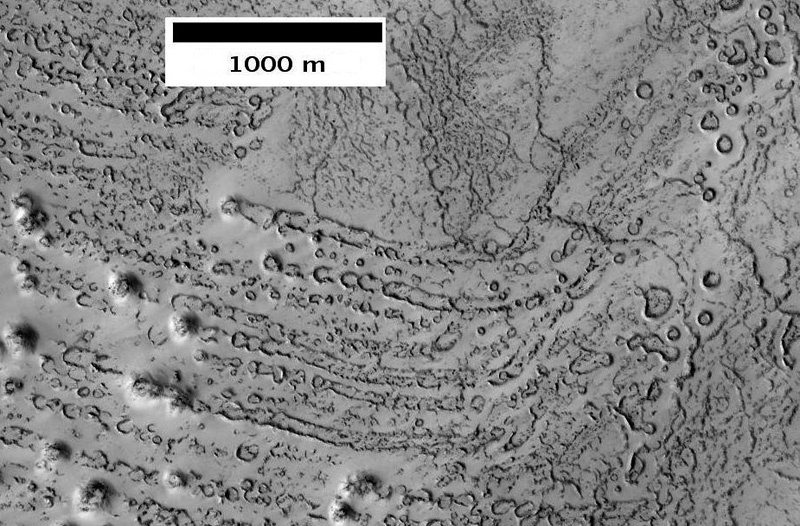 Volcano-ice interactions on Mars . J. Geophys. Res. 84, 8048-8059. Frey, H., B.L. Lowry, S.A. Chase, 1979. 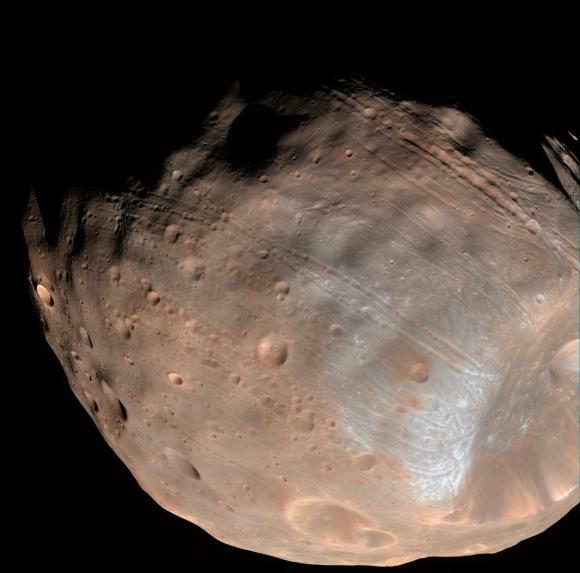 Pseudocraters on Mars . J. Geophys. Res. 84, 8075-8086. Keszthelyi, L.P., W.L. Jaeger, C.M. Dundas, S. Martinez-Alonso, A.S. McEwen, M.P. Milazzo, 2010. 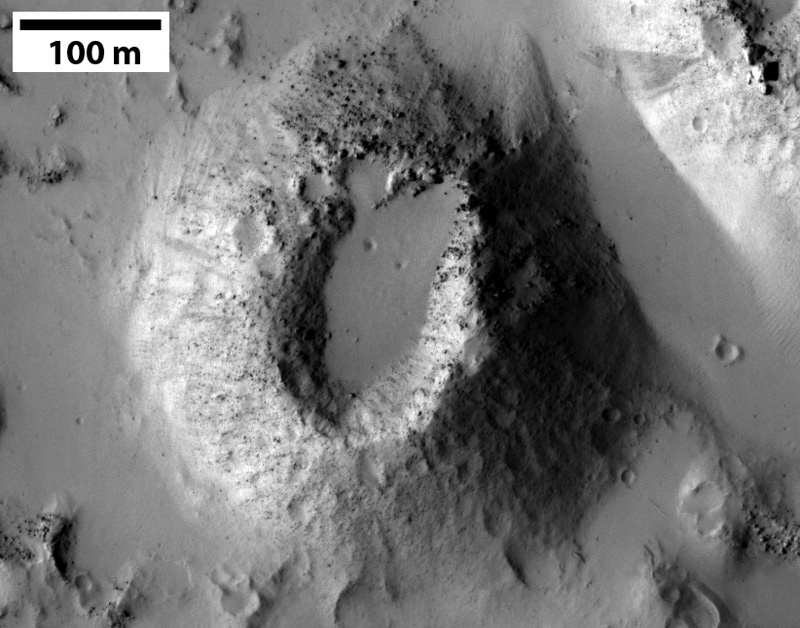 Hydrovolcanic features on Mars: Preliminary observations from the first Mars year of HiRISE imaging. Icarus 205 , 211-229, doi: 10.1016/j.icarus.2009.08.020. McEwen, A.W., et al., 2007. MRO’s High Resolution Imaging Science Experiment (HiRISE) . J. Geophys. Res. 112, doi: 10.1029/2005JE002605.